*Wow. Alabama goes 14-0 and defeats another blueblood to win the national championship. A day later, a coach jumping ship pushes the Crimson Tide to page two. Of course, the rumors surrounding USC coach Pete Carroll's apparently imminent departure from Troy are multiplying faster than the zeros in his bank account. In a town like Los Angeles, everyone supposedly knows someone who knows what's up with the situation. At this point, however, only the most blatantly of blatant USC homers don't see the writing on the wall vis á vis the ongoing NCAA investigation into the school's athletic department. Despite all the success Carroll had at Southern Cal, the epitaph on his tenure can't be written until the Association's findings are known. College athletics' amateur guidelines may seem stupid, but those are the rules of the game. In a town like Los Angeles, turning a blind eye to all the ex-con runners and wanna-be agents is no different than ignoring overzealous boosters. *In my opinion, Carroll is making a huge career mistake here, but I'm not talking about the move to the NFL. He should go into TV. He was outstanding in his stint as a guest analyst for ESPN's coverage of the national title game. *Speaking of the NFL, it's time to dump the Rooney Rule. I understand the NFL's desire to promote minority coaching candidates, but come on. It's patronizing and downright insulting for these teams to bring in guys like Jerry Gray and Leslie Frazier for an interview just for the sake of keeping up appearances. *If Sooner fans are looking for any potential Trojan recruits for Oklahoma to poach, keep an eye on Xavier Grimble. Grimble, a tight end out of Las Vegas, jilted OU last year when he committed unexpectedly to USC. Given the departure of Jermaine Gresham and lack of productivity from OU's tight ends in 2009, you can bet Bob Stoops will at least try to re-open the lines of communication with Grimble. *The injury to Colt McCoy certainly made for a disappointing twist on the national championship game. Yet, the pundits arguing that Texas definitely beats 'Bama with a healthy McCoy under center are foolish. Anyway, you want to slice it, 'Bama was the better team, and McCoy wasn't going to help the Longhorn D stop Trent Richardson and Mark Ingram. *I'll write about this at some point in the next couple days, but for all the questions about Nick Saban's curious calls Thursday night, Mack Brown screwed the pooch plenty himself. *I had painful flashbacks of the 2004 Sugar Bowl when 'Bama linebacker Eryk Anders laid that bone-crushing hit on UT's Garrett Gilbert late in the fourth quarter, forcing a game-sealing fumble. *Sooner fans celebrating the departure of McCoy for the pros may want to take it down a notch. For all his early struggles, Gilbert showed all the promise in the second half against 'Bama that made him such a coveted recruit. 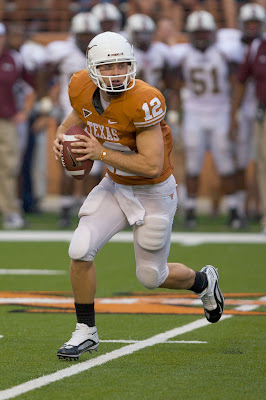 Next year, I'd bet the loss of Jordan Shipley will be a far bigger blow for UT. The current Texas receiving corps has plenty of talent, but shouldn't guys like Malcolm Williams and James Kirkendoll be, ya know, improving? *So Kirk Herbstreit has OU ranked third heading into next season, huh? Even Homerism can't put the Sooners that high. Huge losses on the defensive line, both cornerbacks are going to the NFL and we still don't know if Jeremy Beal, Travis Lewis and Ryan Broyles will decide the potential for a new labor agreement in 2011 is reason enough to go pro sooner than later. *NFL playoff picks: Bengals -2.5, Cowboys -4, Ravens +3.5, Cardinals -1. *Lastly, you know those humiliating moments of that you look back at and want to cry? Football to the groin. Wearing your Winger t-shirt. The time you put gel in your hair. Farting during your son's circumcision.